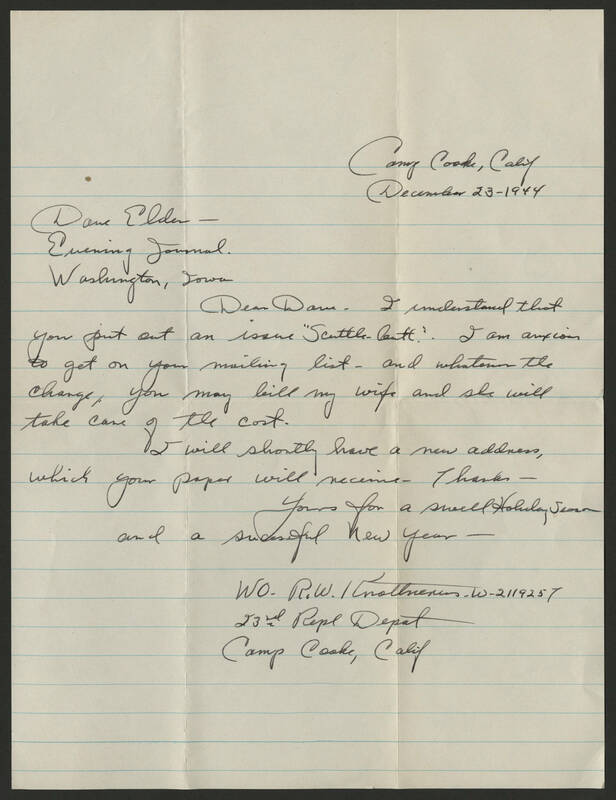 Camp Cooke, Calif December 23 - 1944 Dear Elder- Evening Journal. Washington, Iowa Dear Dave. I understand that you put out an issue "Scuttlebutt." I am anxious to get on your mailing list - and whatever the charge, you may bill my wife and she will take care of the cost. I will shortly have a new address, which your paper will receive - Thanks - Yours for a swell Holiday Season and a sucessful New Year - WO - R.W. Knottneness - W - 2119257 23rd Repl Depat Camp Cooke, Calif.